HOLLYWOOD: Our eyes! They burn! 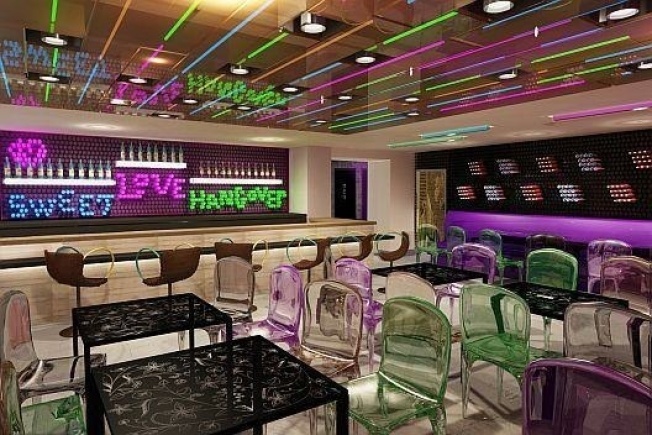 This Vegas-style Lite Brite abomination-- called Sweet Love Hangover--is the newest 24-hour dining option in Hollywood. Additionally, a club called Playhouse will take over the former Fox Theatre on Hollywood Boulevard. Expect it to open the second week of December. DOWNTOWN: Culver City's BottleRock announced plans to open a second outpost in downtown as far back as early 2007. Now it looks as if it might actually open. Eater projects the wine bar, located on the ground floor of the Met Lofts, will open in January. WEST HOLLYWOOD: Beleaguered shopping center 8000 Sunset is losing another tenant. California Pizza Kitchen will be closing for good tomorrow, Nov 8. Word is parking was problematic and business has been slow. Still no visible signs of progress at the incoming Trader Joe's, Pinkberry, and Starbucks.